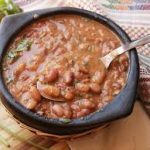 You can make these Pinto beans more spicy by adding some of your favorite hot sauce, jalapenos or Serrano chiles.Note: You can change the number of people served by placing your cursor over "Servings". The Ingredients will adjust to the new number of servings. In a dutch oven or large pot, cover beans with at least enough water to be covered by 2 inches and leave overnight. Drain off the water, rinse thoroughly with hot water and pick through to throw out any foreign looking objects. Cover beans with beef broth and enough water to cover the beans by 2-inches and bring to a boil. Add the ham hock, onion, chili powder and garlic. Simmer gently until tender, about 1 1/2 hours. Just before they are done, remove the ham hock and remove the meat from the bone and return it to the beans. Check the beans for seasoning and add salt and pepper as needed. If you don't want to soak the beans overnight, just put the dried beans in a saucepan, cover with water about 2 inches, bring to a boil, take off heat and allow the beans to sit for at least one hour covered. Then drain, rinse and cook.